The new family: Kathy, Jill, and Bill. 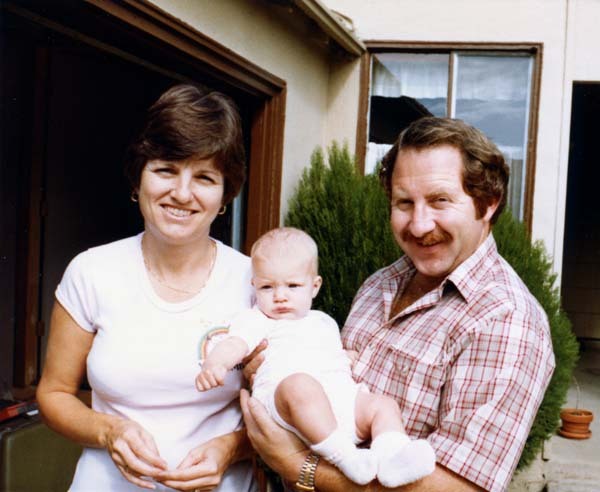 From the early 1980s through the late 1990s I worked for EG&G Energy Measurements. Las Vegas was our headquarters, but I often traveled to our satellite locations. We had seven offices scattered throughout the United States (and one in Europe) that supported the various national nuclear weapon laboratories. One of those facilities was in Livermore, California, obviously near the Livermore National Laboratory run by the University of California. These business trips to Livermore got me within reasonable driving distance to Sacramento where my good friend, Bill Bergan, lived. 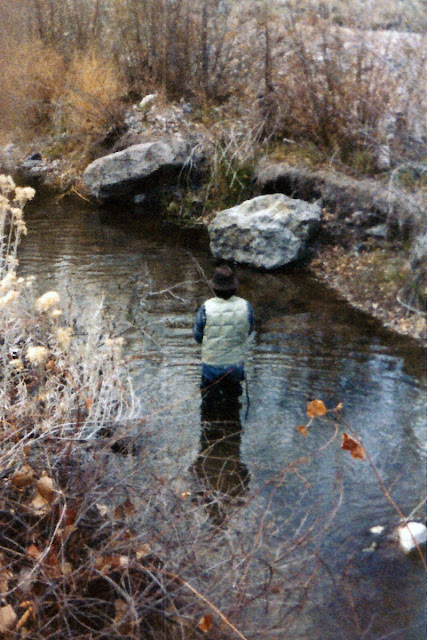 Bill tugging on Lahontan cutthroat caught at the Martis Creek inlet. 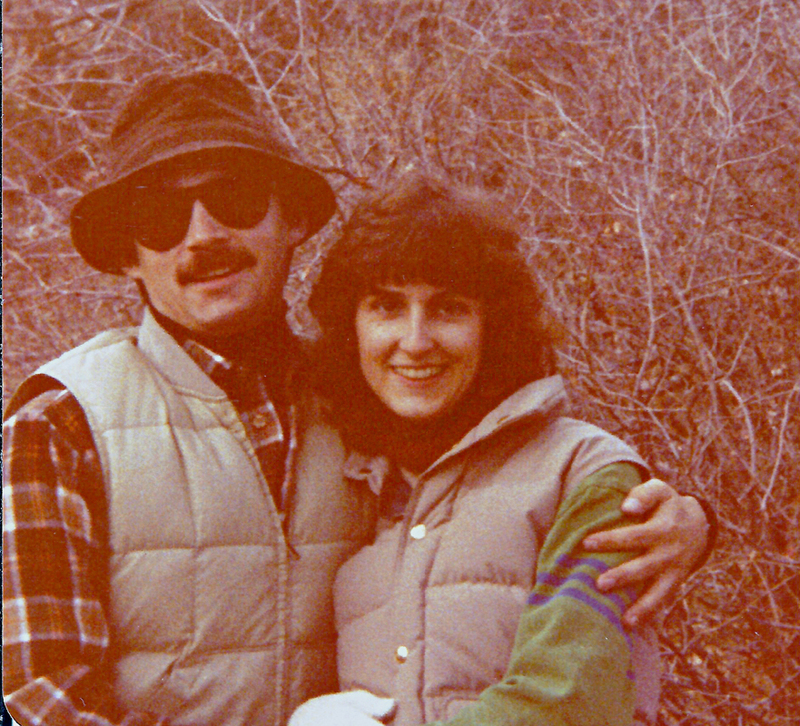 Bill had persuaded me to make a weekend foray into the Donner-Truckee area near Lake Tahoe. I always marvel at the number of people Bill knows who have property they freely let him use. Bill has a remarkable ability to befriend all sorts of people. He also has a gracious generosity about him that seems to swell to all those around him. So I was not surprised that a friend had loaned him the use of a condo near the Squaw Valley Ski Resort. The gods of adventure having aligned, I flew into Oakland and drove a rental car to Sacramento. From there Bill drove us to Tahoe. Neither of us had climbed for a couple of years, but Bill insisted we bring the climbing gear in case a granite crag called to our masochistic temperament. 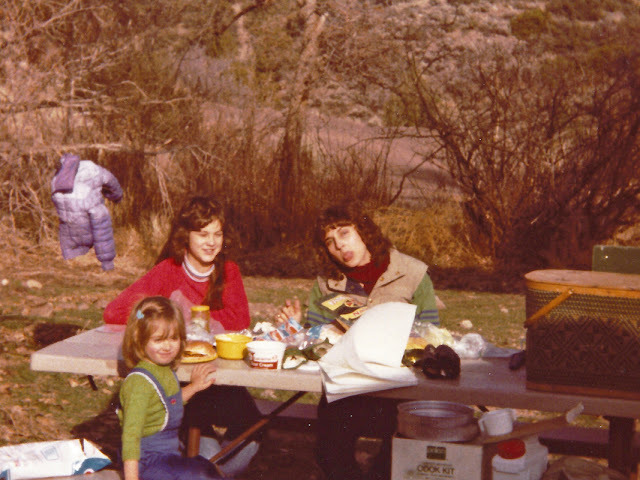 I was not overly excited about climbing as family life had changed my perspective on risky adventures, not to mention that our assenting skills were waning. Fortunately, a weekend drizzle reduced our climbing sorties to mere admiration of wet granite cliffs from the highway. The light rain, however, did foretell some excellent fishing on the Martis Creek Lake. There are four tributaries that feed Martis Creek Lake: Martis Creek, West Fork Martis Creek, Middle Fork Martis Creek, and East Fork Martis Creek. The combined Martis Creek outflow from the reservoir flows into the Truckee River which in turn terminates in Nevada's Pyramid Lake. 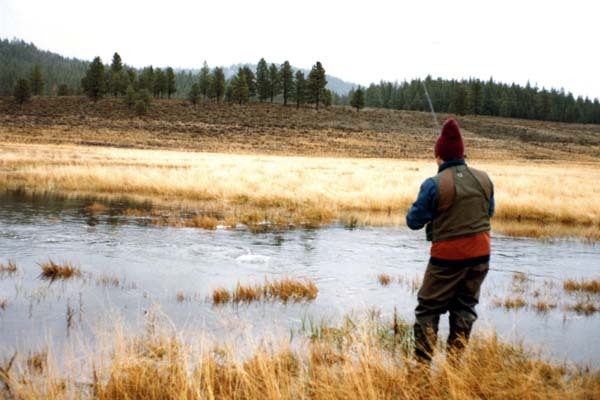 Martis Creek Lake was the first water designated "catch and release, trophy trout" in California. 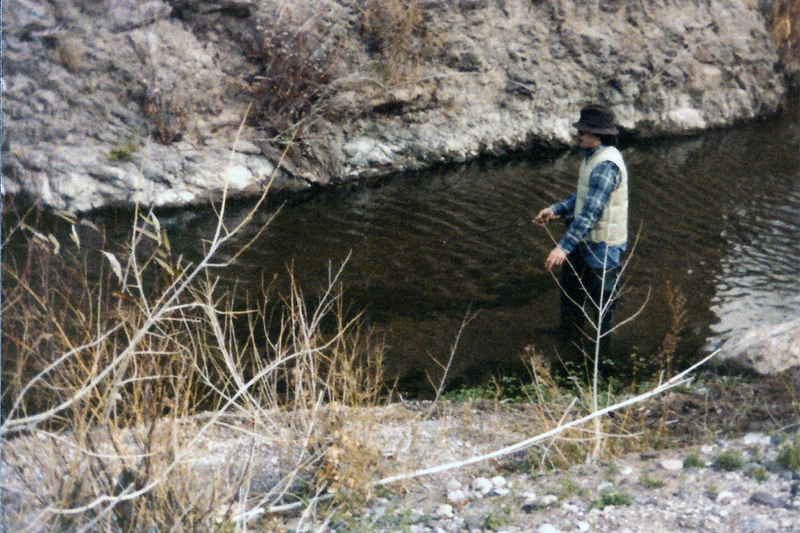 Misguided attempts to reintroduce Lahontan cutthroat with rainbows and browns eventually decimated the cutthroats. Cutthroats readily hybridize with rainbows, not to mention the competition for habitat and food with two other stronger species. Anglers must use barbless hooks and artificial lures only. Live bait is not permitted. 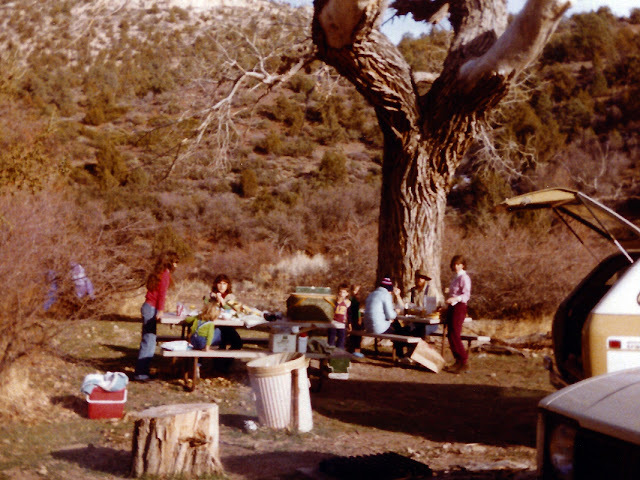 Through cooperative efforts with the California Department of Fish and Game, a self-sustaining trout fishery is being re-established at the lake. All trout caught must be released back into the lake for this program to succeed. At the time we visited Martis Creek fishing was not allowed in the tributary streams above the lake. Back in the late 1800s and early 1900s, these Truckee watershed Lahontan cutthroat trout commonly attained weights in the 40 lbs. to 60 lbs. class. Big fish! 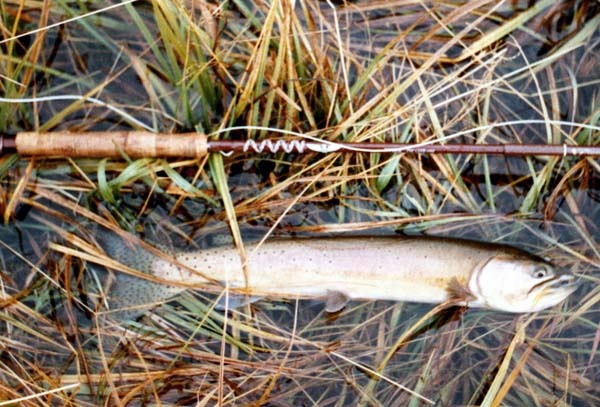 A sleek seventeen-inch Lahontan cutthroat along side my Fenwick pack rod. There was a cold drizzle upon arriving at the lake. The immediate benefit of that was solitude; we were the only idiots attempting to fish. We proceeded down to the Martis Creek inlet and began fishing, casting upstream and drifting large streamers down into the lake. Despite the rain, we began to catch numerous Lahontan cutthroats in the fourteen to seventeen inch range. Unfortunately, none had any weight to them. They were all head and tail resembling sleek torpedoes. Lahontans are native to the northern arid Great Basin. They are famous for being the largest growing trout species. 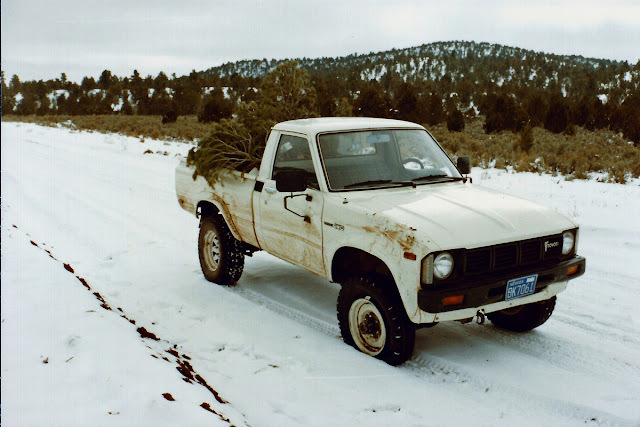 They used to spawn up the Truckee River, all the way from Pyramid Lake, northeast of Reno. Commercial and sport fishing, and especially the introduction of non-native species to the watershed have decimated their numbers. 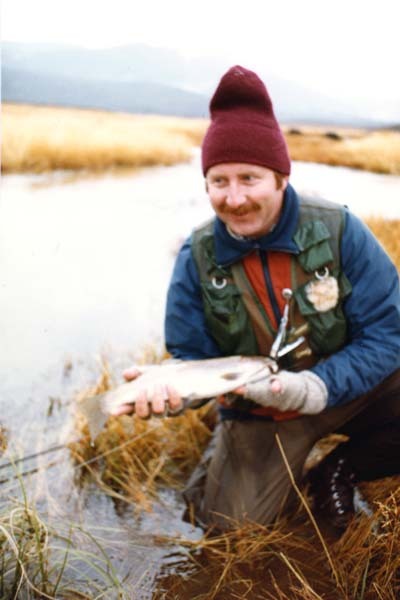 Unfortunately, cutthroats will readily hybridize with rainbows which erodes the gene pool (commonly called “cut-bows”). After a while, Bill and I started fishing upstream from the lake, casting the large streamers up against the bank and stripping them down in the light rain. Fortunately, we never saw the "No Fishing" sign posted for the creek until after we were done fishing. In just a few casts, BAM! 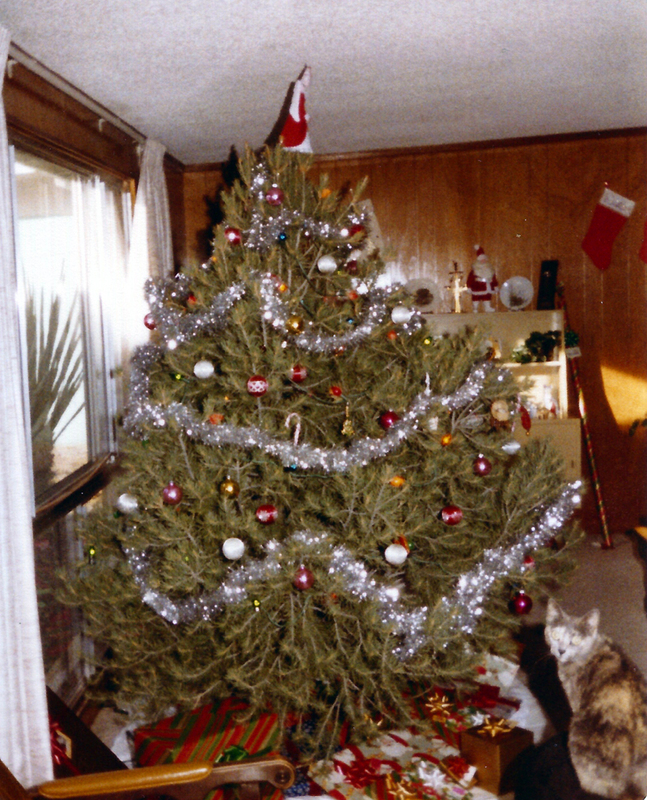 We both hooked into large cut-bows that seemed close to eighteen inches and weighing two pounds or more. Wow, did those trout like to leap. With a bit of bad luck, Bill’s camera malfunctioned so he couldn't provide pictures of me holding the large cut-bow. But it was essentially a twin of Bill’s, so my memories live vicariously through my photo of Bill holding his. in his eyes, he's actually looking at another trout rising downstream. The action was remarkably brisk in the drizzling rain. The final epitaph of the trip was that I could not break down my Fenwick pack rod once we got off the water. Perhaps due to temperature changes, one of the ferrules was stuck. In my last failed attempt to separate them my hand slid down the rod and dislodged a stripping guide from its varnished wrappings. Since I could not get the rod back into the case I left it with Bill. 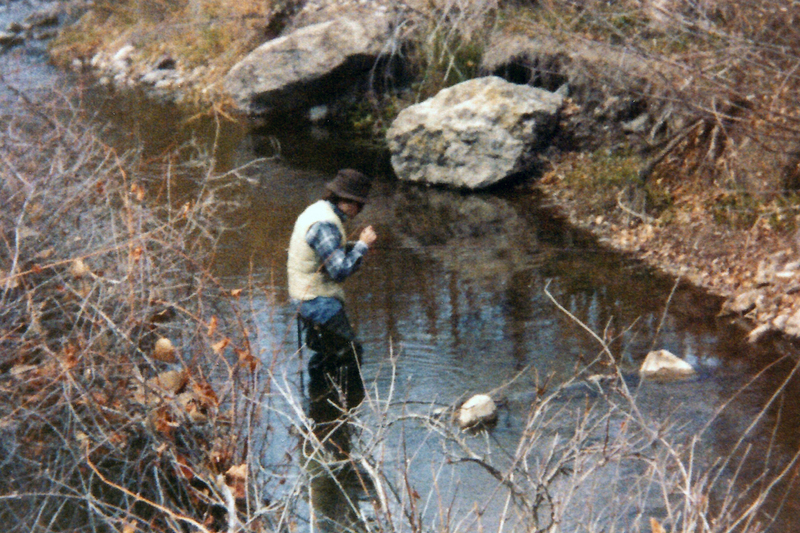 I had all but forgotten about the rod until Bill brought it on our Henderson Springs trip in 2003. Twenty-one years after Martis Creek, Bill was able to separate the ferrules, repair the guide, and return it good as new. What a guy! Over the years I've learned that mildly inclement weather is often good for angling. In many of my adventures with Bill, drizzly clouds produce outstanding results that contrast against an acceptable level of pain and discomfort. 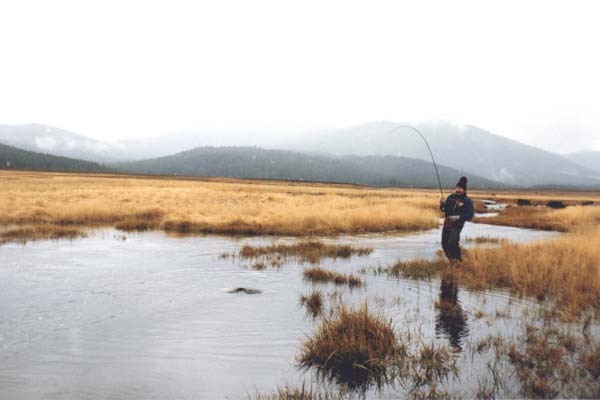 Such was the case of fly angling Martis Creek in the rain. And yes, our wives know us to be crazy. Bill fighting a Martis Creek Lahontan cutthroat just above the inlet into the reservoir.